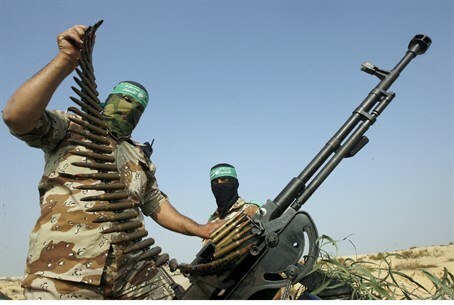 Hamas officials deny that the group fired rockets, threaten Israel over its retaliatory airstrikes. Hamas on Wednesday night placed the blame on Israel for violating a ceasefire, warning that it will pay the price for doing so. The group’s spokesman in Gaza, Fawzi Barhoum, warned that Israel had “blatantly violated” the ceasefire with its airstrikes in Gaza and "will bear responsibility". Another Hamas official, Izzat Al-Rishq, followed by saying Hamas had not violated the ceasefire. "There is no violation of the calm from any Palestinian side and nobody in Gaza has heard rocket fire," Rishq, a Hamas official who is in Cairo for Gaza truce talks, told Reuters. "We denounce the Israeli shelling of Gaza which is continuing. This is a violation of the calm," he declared. Hamas violated a 72-hour ceasefire hours before it was set to expire at midnight, then continued firing rockets even after an extension of five days was announced. Israel responded by launching airstrikes against several terror targets in Gaza. Israeli media reported on Wednesday night that Prime Minister Binyamin Netanyahu and Defense Minister Moshe Ya’alon had ordered the IDF to respond to the rocket fire.